I’m back with another post re-do! 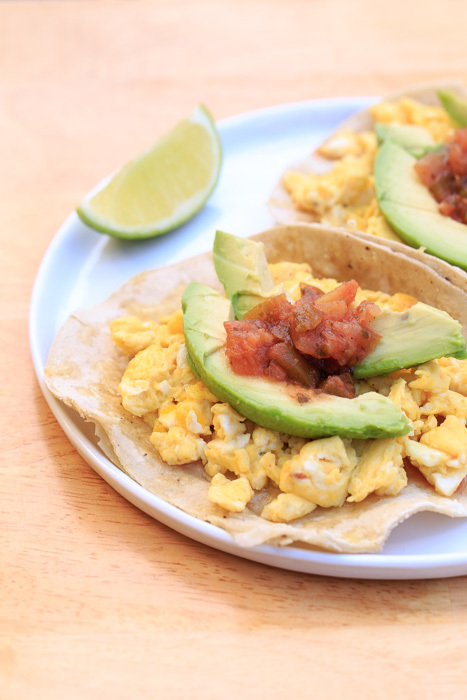 This time I tackled my quick and delicious 10 Minute Mini Breakfast Tacos. 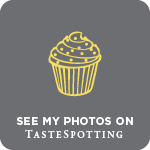 I’ve updated the post with new photos, some new content and minor recipe adjustments. 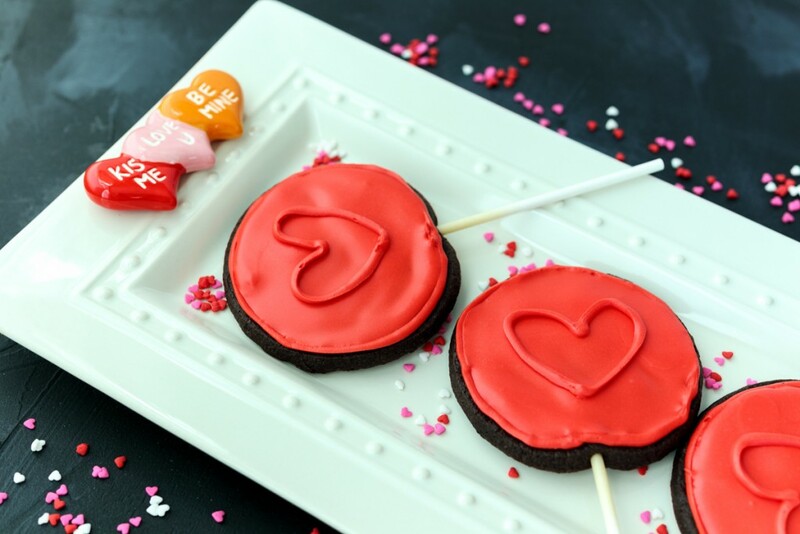 Check out the updated recipe here. Below is one of the original photos posted in August 2014. The old photos lack any sort of punch or contrast. Part of that was my editing at the time and part of that is that I put beige food on a white plate on a beige surface! I love the way the blue plate really livened up my new photos. 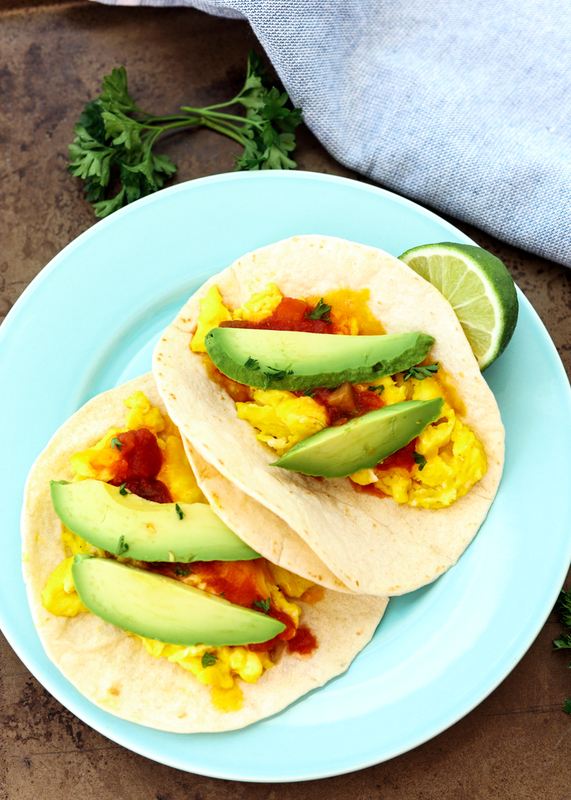 I also loved having an excuse to make and eat these breakfast tacos – not that you need an excuse because they really are simple enough for a regular weekday meal! 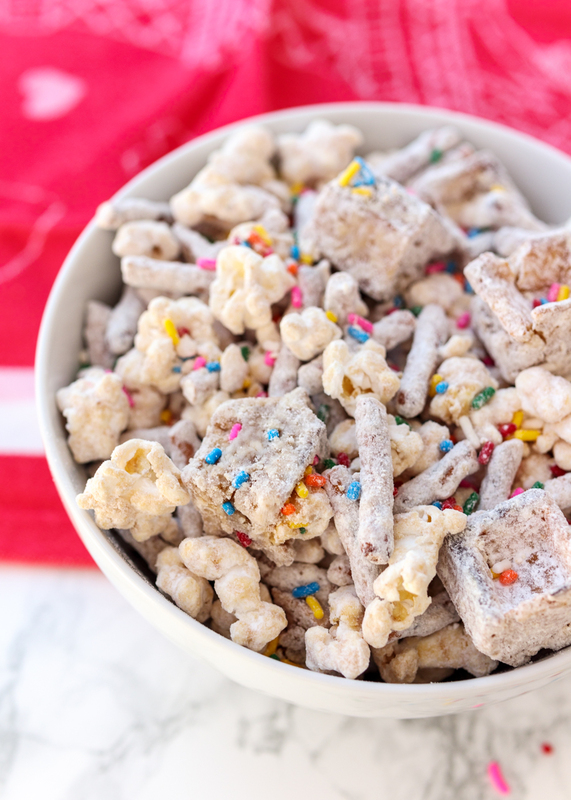 Funfetti Peanut Butter White Chocolate Waffle Snack Mix! Just writing the name of this post is getting me excited! Sometimes you want a dessert that’s easy and doesn’t require any baking. Sometimes you want a dessert that’s called a snack so you can eat it whenever you want. And sometimes you just want something you can cover in rainbow sprinkles. 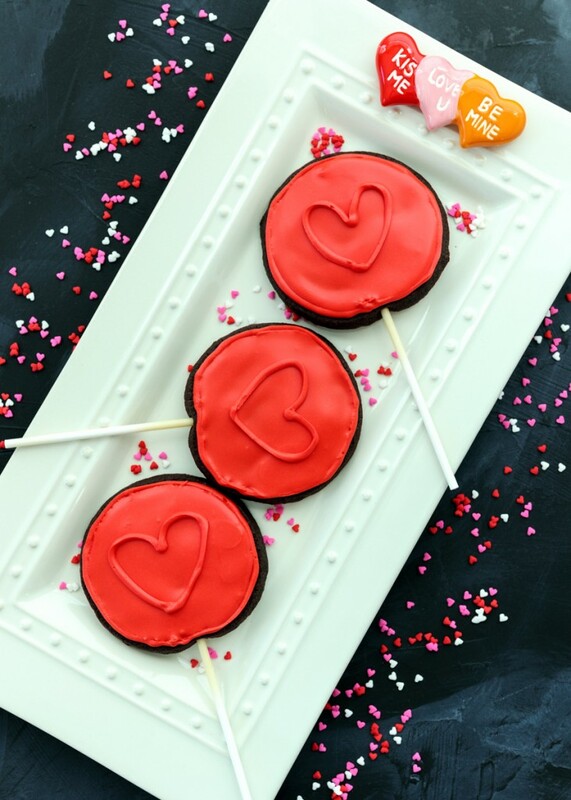 All of these scenarios are perfect reasons to make this sweet and salty treat. 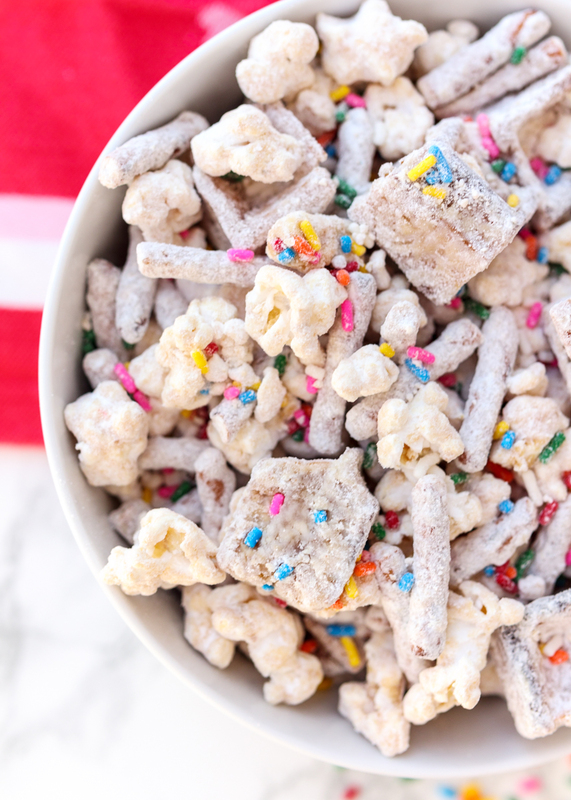 This snack mix is a slight twist on normal muddy buddies. 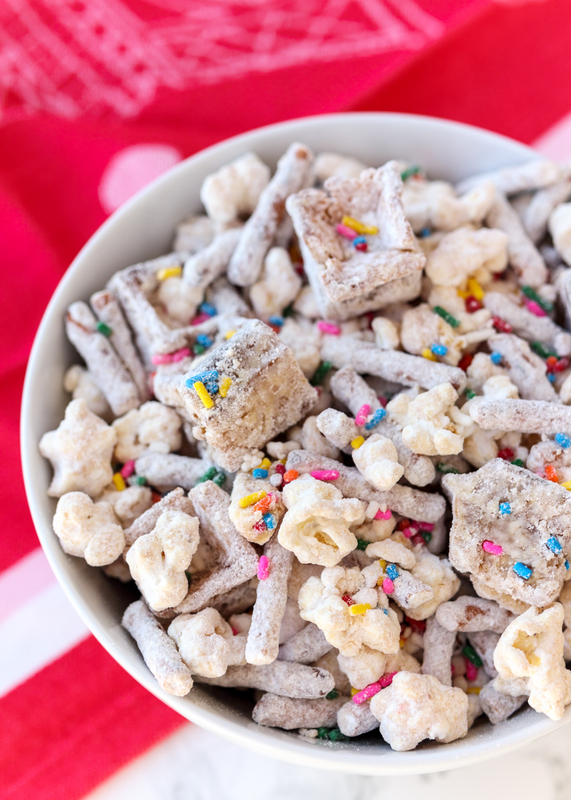 Muddy buddies, or puppy chow, is rice cereal that’s been tossed in a peanut butter chocolate mixture before being coated in powdered sugar. 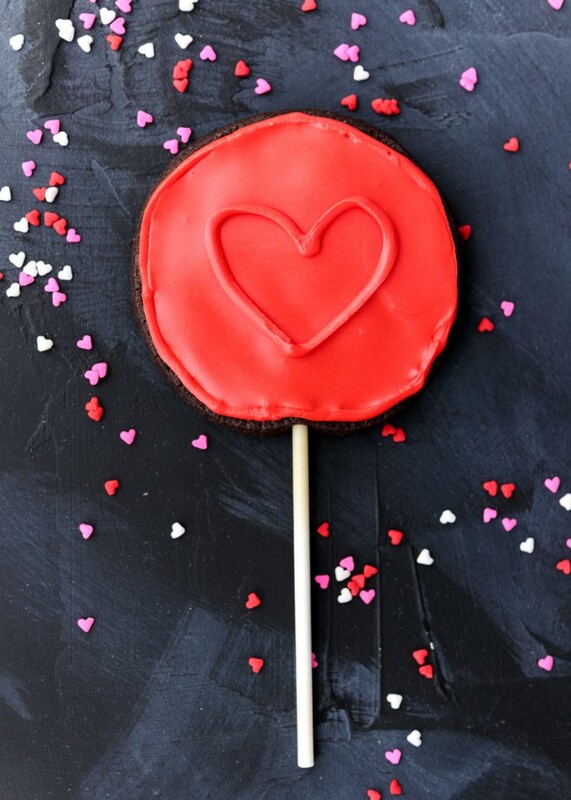 Today we’re swapping the chocolate for white chocolate and there’s no rice cereal in sight. That’s because instead we’re using pretzel sticks, popcorn and buttered Belgian waffles! Yes, I said waffles. Pretzel sticks help bring in a little saltiness to the snack, which is great since white chocolate is pretty sweet. You could always use mini pretzels instead of pretzel sticks, but I still had some in our snack drawer from the Game Day Cookies. Have you ever had chocolate coated popcorn? 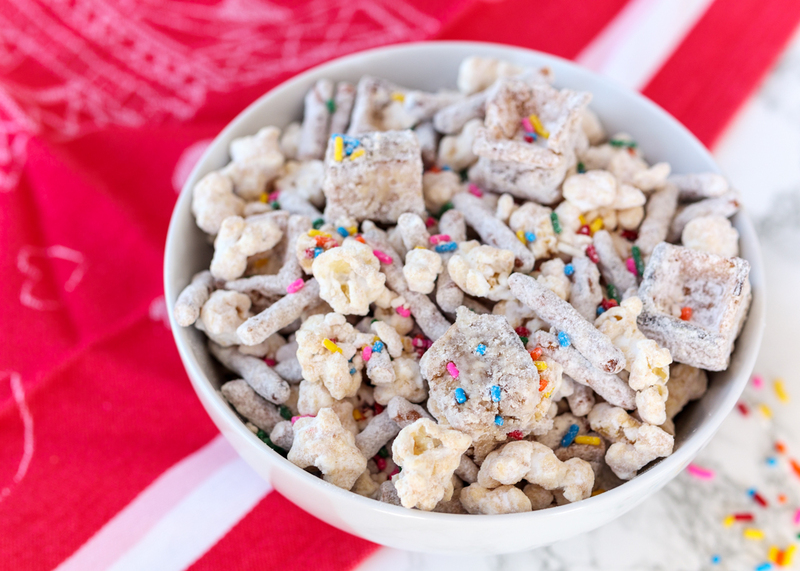 It’s one of my favorite treats so I love having the popcorn in this snack mix. There are three ways you can make the popcorn in the microwave and I have them all listed in the recipe. My ideal method is to use this collapsible silicone popcorn microwave popper. I got it for Matt as part of his Christmas gift a few years ago and it has been a big hit in our house. Since it collapses it takes up minimal space (kitchen cabinet space is precious!) and you can pop popcorn kernels in it without any oil. Sur La Table doesn’t sell the one I bought anymore, but I found it on Amazon. If you don’t want to go that route, you can always use a paper lunch bag or a microwave safe bowl with a microwave safe plate fit on top. I haven’t tried that last method, but I’ve seen a lot of people mentioning it as a way to microwave popcorn without a bag. Anyways, moving on to the star of this snack mix – the buttered waffle pieces! 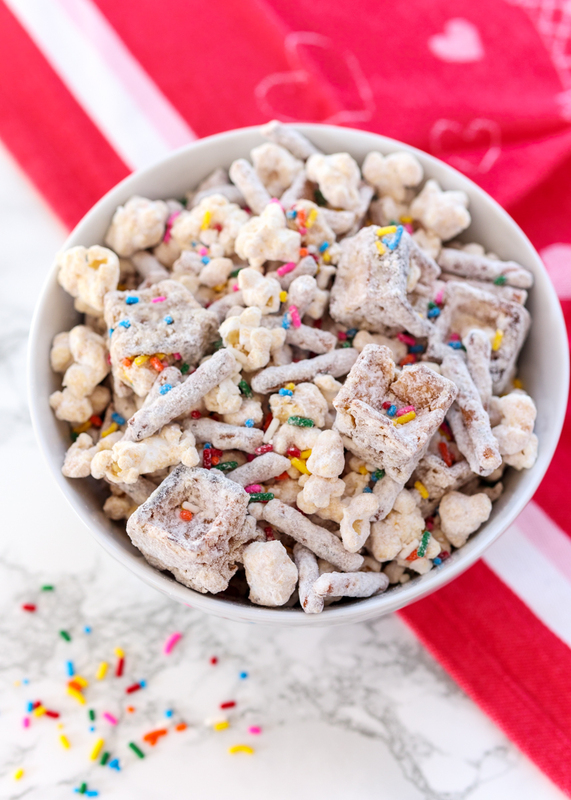 I think every snack mix in my future needs to include chunks of Belgian waffle covered in powdered sugar because it is seriously addictive. I used frozen cinnamon Belgian waffles from Wegmans and that extra cinnamon flavor sent them over the top. Also, I don’t know how I’ve gone this whole post so far without drooling over the peanut butter in this since I’m peanut butter obsessed. The peanut butter flavor mixed with the white chocolate is absolute perfection. 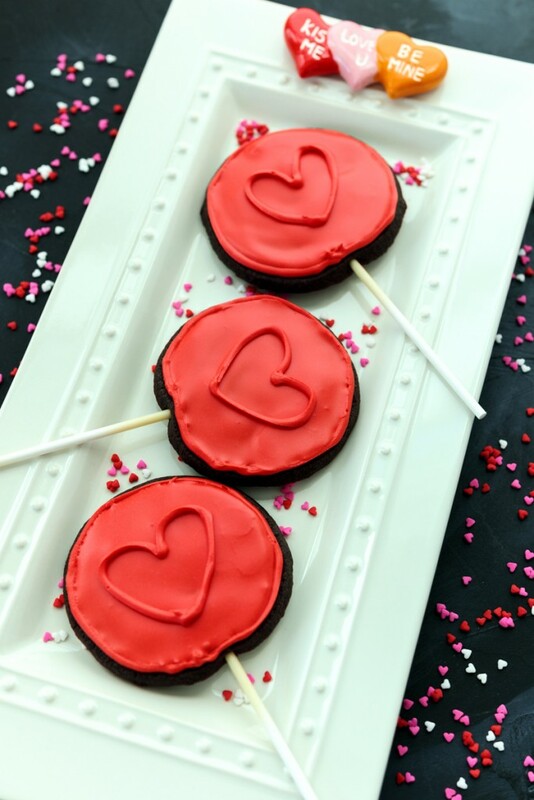 I hope you enjoy this tasty treat and happy early Valentine’s Day to you all! Place the popcorn kernels in either a brown paper bag with the top folded closed a couple times, a silicone microwave popper with the lid on, or in a medium microwave safe bowl with a microwave safe plate snugly fitted on top. Heat the kernels starting with 3 minutes and stopping the microwave as soon as the popping becomes infrequent. Carefully remove from the microwave and place in a large mixing bowl. If there are any un-popped kernels save them for the next time you make popcorn. Toast the Belgian waffles in your toaster or toaster oven. When they’re toasted, divide the butter between the waffles and it on both sides. Cut the waffles into bite-sized pieces. Add the waffle pieces and broken pretzel sticks to the mixing bowl with the popcorn. Melt the white chocolate in a small microwave safe bowl. Start with 30 seconds, carefully remove and stir, then continue in 15 second increments, stirring after each increment, until it is melted. White chocolate seizes up easily so be sure not to over-heat. Add the peanut butter and stir until smooth. Pour the peanut butter white chocolate mixture over the bowl of snack mix. Gently toss to coat completely. Add the sprinkles and toss to coat. Sprinkle on the powdered sugar and toss to coat. Add more if needed. 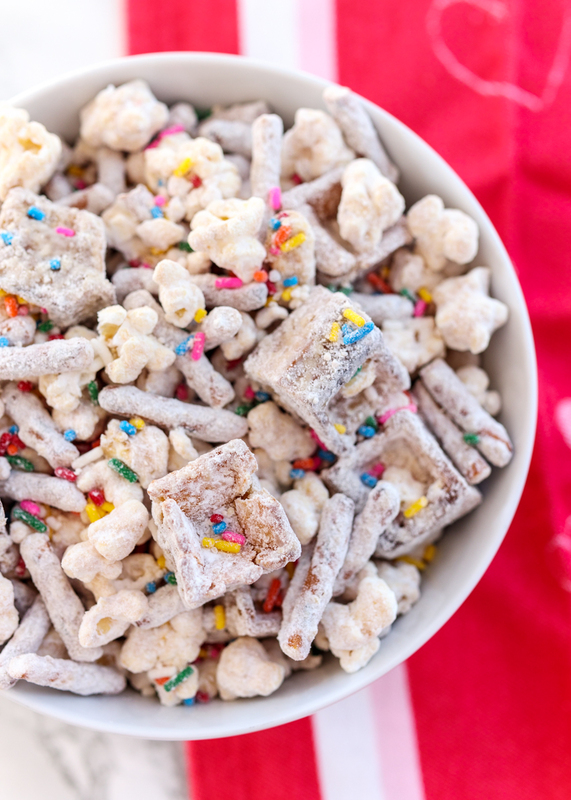 Snack mix can be stored in an airtight container, but tastes best eaten right away. 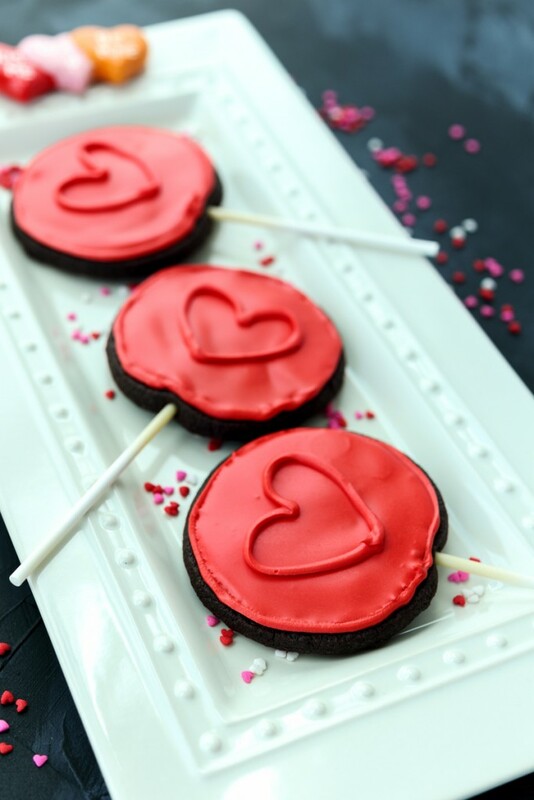 These recipe can easily be halved or doubled. Recipe slightly adapted from Averie Cooks. 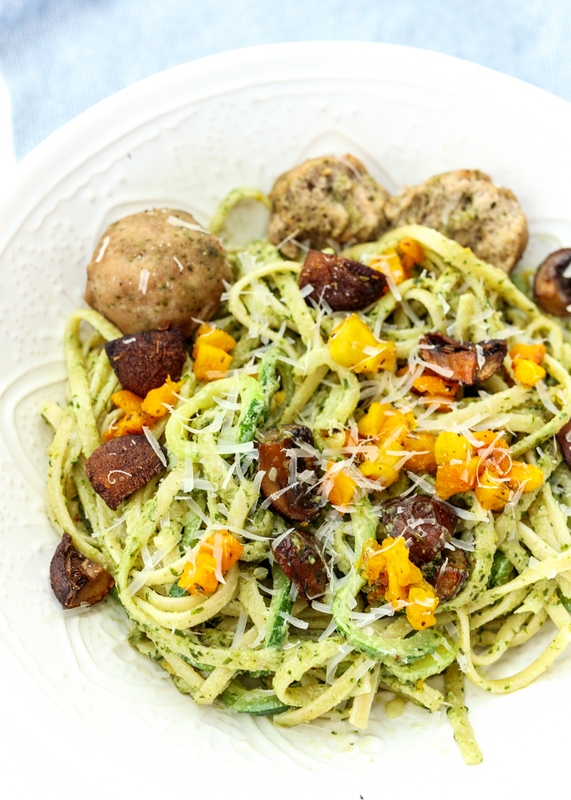 Winter Pesto Pasta is a cozy dish loaded with roasted butternut squash and mushrooms that is sure to warm you up during these chilly winter days. 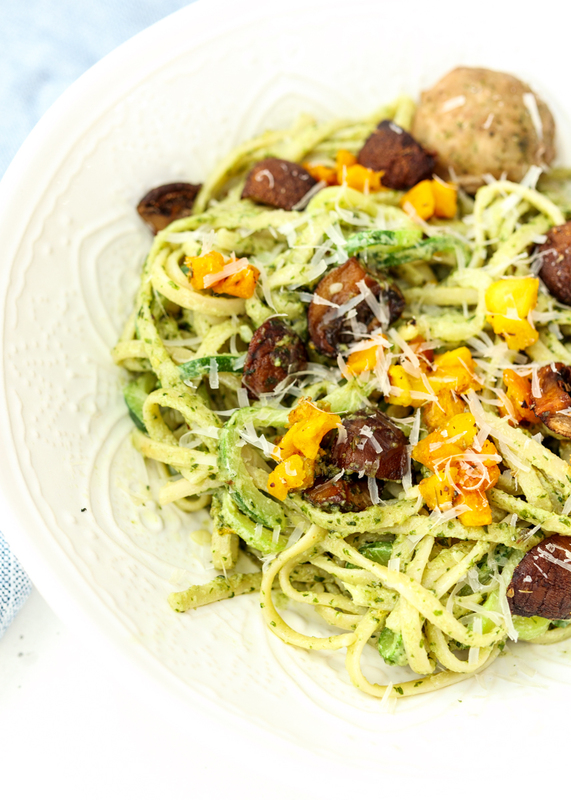 Whenever Matt and I are craving pasta I like to load it up with lots of veggies and I love the ease and the taste of roasted vegetables, especially in the wintertime. I also used a mix of spaghetti and zucchini noodles to sneak in even more vegetables. You can spiralize the zucchini yourself or pretty much every grocery store now sells spiralized vegetable noodles. The best part is that you just throw them into the water when the pasta is almost done cooking so it could not be easier to add zucchini noodles into your pasta dishes. 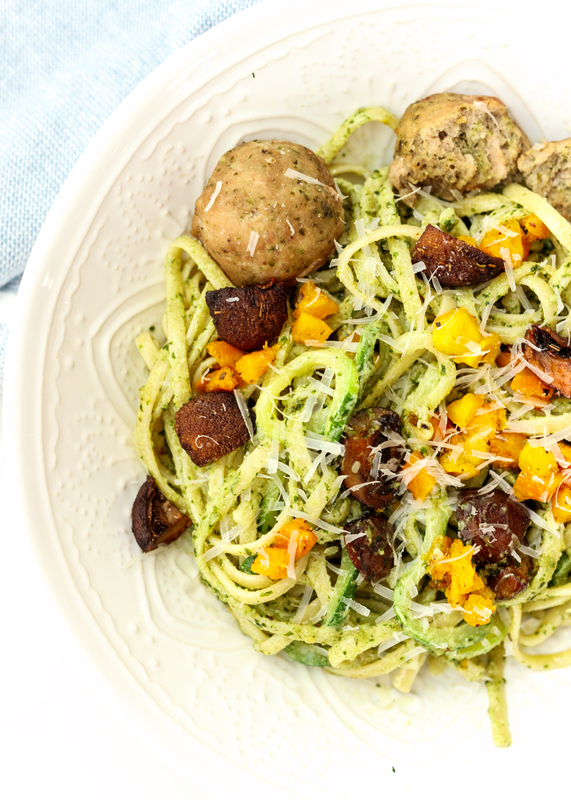 You could keep the meal vegetarian, but I served it alongside my Baked Pesto Turkey Meatballs – love those! The star of the whole dish, though, is the quick and easy homemade pesto. I love tomato sauce, but we are both way more into pesto around here. My favorite seed butter company, 88 Acres, which is a local Massachusetts company, sent me some of their new products to try in exchange for sharing them on Instagram. The exchange didn’t involve my blog at all; I’m purely sharing this here because their new product prompted me to discover my new favorite homemade pesto hack. Instead of grinding down seeds or nuts to use in the pesto, I just used some of their new no-sugar added pumpkin seed butter. I combined the pumpkin seed butter, basil, Parmesan, garlic powder, a little olive oil and some salt to taste. It was creamy, flavor-packed and saved me from having to buy pricey pine nuts. I’m excited to try this new hack with other seed butters! I would recommend using one that has no-sugar added though to avoid adding sugar to your pesto. 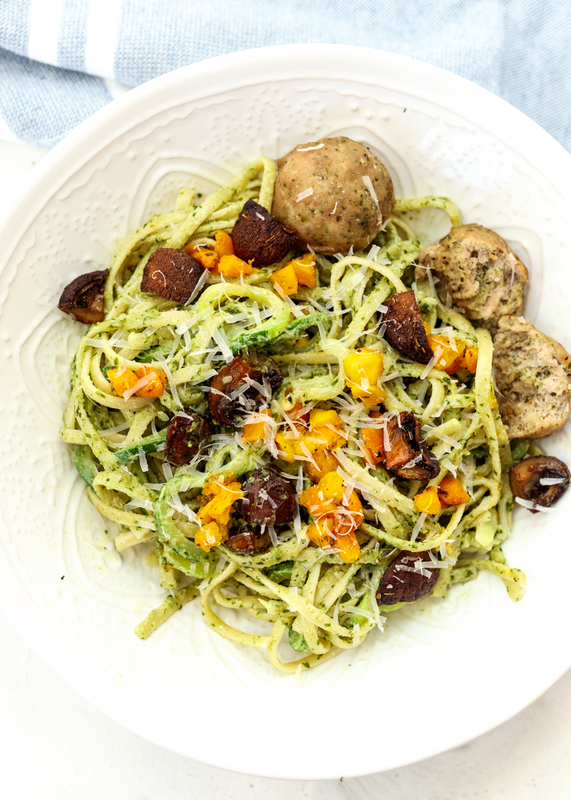 You could also try making this pesto with roasted pumpkin seeds and adding more olive oil, which I’m sure would be really good, too. Do you like experimenting with different types of pesto or do you have a go-to one you make all the time? Preheat the oven to 400 degrees F. Line a baking sheet with nonstick aluminum foil or parchment paper and place the butternut squash cubes and quartered mushrooms in a single layer. Toss the veggies with ½ tablespoon of olive oil then sprinkle with ¼ teaspoon dried oregano, ⅛ teaspoon garlic powder, ⅛ teaspoon salt and some fresh ground black pepper. Roast the veggies for 25 minutes, or until tender and slightly caramelized, tossing once halfway through baking. Cook the spaghetti according to the package instructions. When the spaghetti is 2 minutes away from being done, toss in the zucchini noodles. Drain the spaghetti and the zucchini noodles together once tender in a colander. While the water is coming to a boil for the pasta, make the pesto. Combine the basil, Parmesan, pumpkin seed butter, the remaining 2 tablespoons of olive oil, ⅛ teaspoon garlic powder and salt to taste in a food processor. Add more olive oil if needed, about 1 tablespoon more. Pulse until smooth. 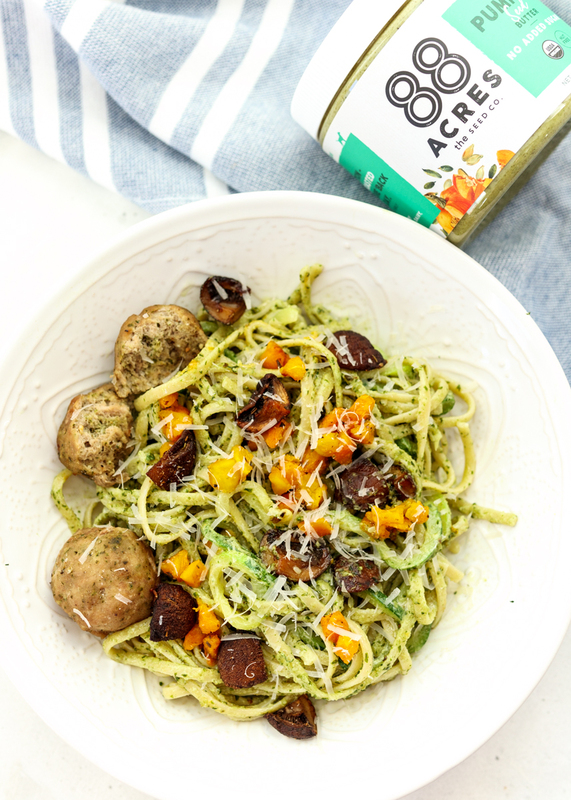 When the spaghetti and zucchini noodles have been drained, add them back to the pot along with the pesto, butternut squash and mushrooms. Toss to combine. 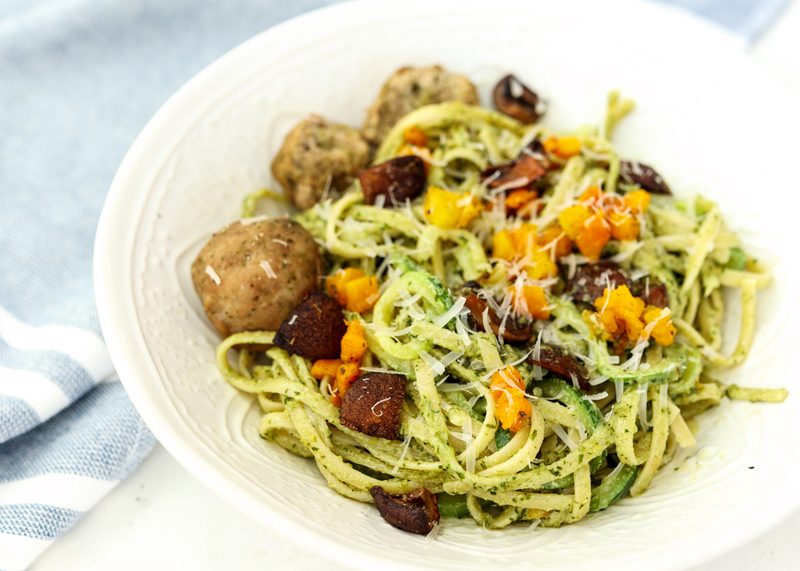 Serve with fresh grated Parmesan on top and baked pesto turkey meatballs, if desired. Did you know that tomorrow is National Pizza Day? Woo hoo! This should really be a throwback Thursday post because this is the first pizza Matt and I ever made together back in 2010. Yes, we’ve been over this, I’m so food obsessed I can usually remember the exact time I made every recipe I’ve ever made for the first time. 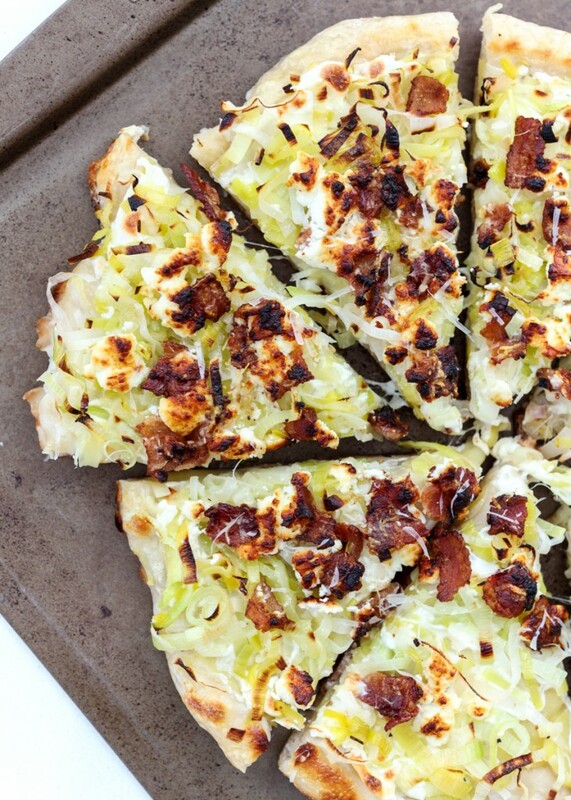 The recipe is from the first cookbook published by the Pioneer Woman, Ree Drummond, which is full of rich and indulgent meals and this pizza is no exception. 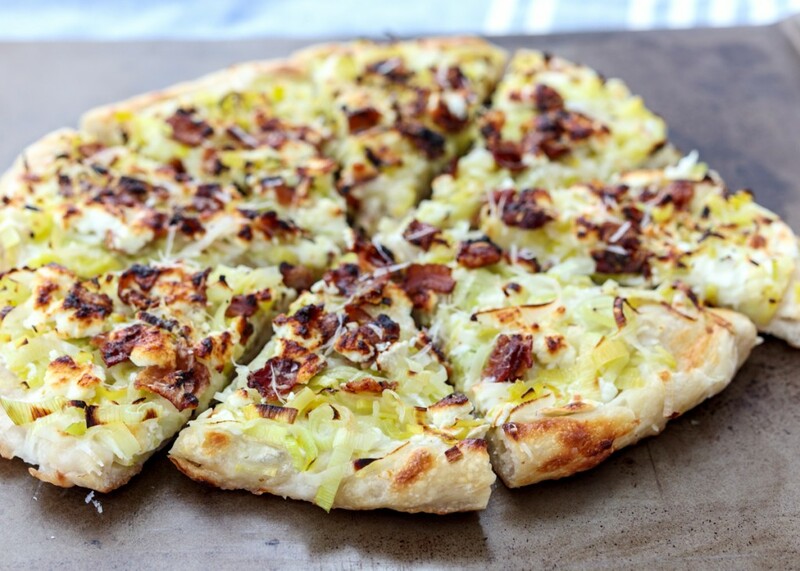 This pizza has layers of thinly sliced potatoes, fresh mozzarella, crispy bacon, creamy goat cheese, leeks sautéed in bacon grease and some fresh Parmesan because why not? 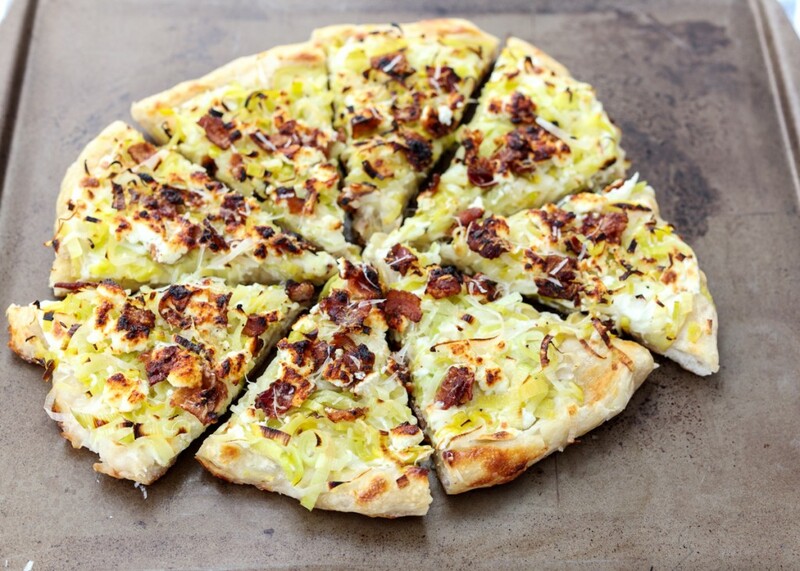 I did halve the amount of fresh mozzarella and reduce the amount of bacon and leeks because I found that I had lots of extra that wouldn’t even fit on my pizza. Have you ever had potato on a pizza? It’s such a tasty and underrated topping. Matt’s favorite pizza to order from our local pizza shop is their potato, bacon and cheddar pizza so he was of course on board when I mentioned wanting to re-make the Pioneer Woman pizza recipe. 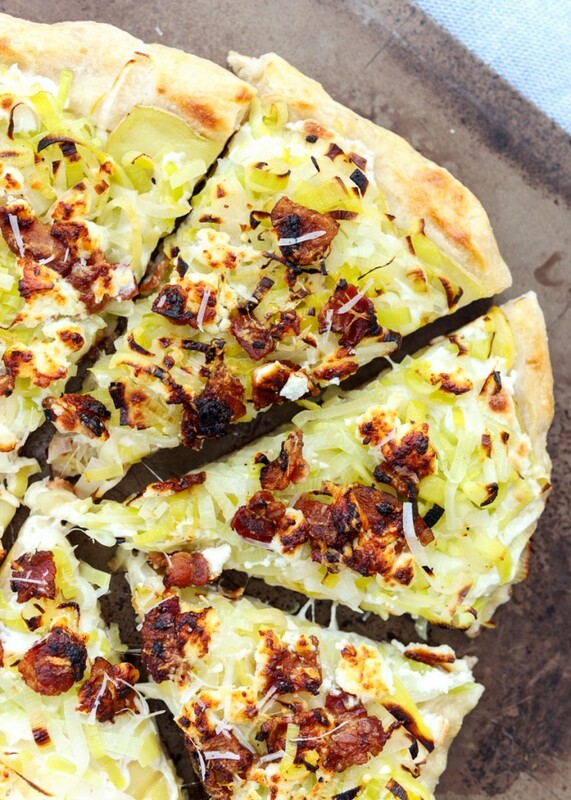 Potato, Leek and Bacon Pizza is the perfect balance of creaminess, saltiness and omg-give-me-another-slice-iness. Totally a thing. If you find yourself with some leftover leeks, I highly recommend making Kale and Walnut Pesto Pasta with Lemon Shrimp. Ah, I think I will forever be obsessed with that recipe! But back to this pizza and National Pizza Day! If you’re looking for some more pizza inspiration I have a few recipes on here that are sure to bring your pizza night to the next level! Preheat your pizza stone in the oven at 475 or 500 degrees F for at least half an hour. 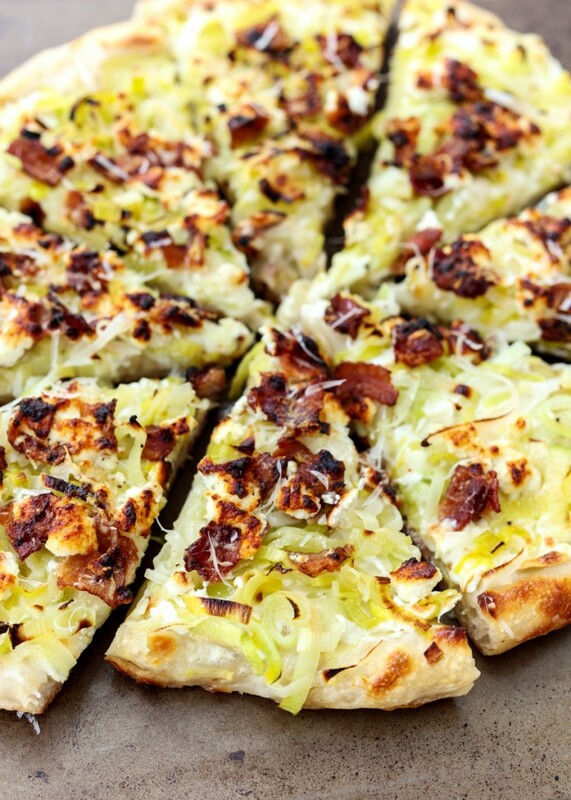 While the pizza stone is preheating, cook the bacon and leeks. Heat the chopped bacon in a large skillet over medium heat until cooked, but not overly crispy. Remove the bacon from the pan using a slotted spoon and place on a plate lined with a paper towel. Safely pour the grease off the skillet, but do not wipe the pan clean. Over medium-low heat in the same large skillet, sauté the leeks until soft, about 3 minutes. Season with salt and pepper. Then set aside. If you are using a pizza peel, generously sprinkle your pizza peel with cornmeal. If you don’t have a pizza peel and are using a baking sheet, generously sprinkle your baking sheet with cornmeal. Stretch out the dough - the size depends on the size of your pizza stone. To help get it stretched out, I hold it and let it fall down. I continue doing this, rotating around as I do it so it stretches into an oblong shape. Now that it is most of the way stretched out, place it on the cornmeal surface, whether that is your pizza peel or baking sheet. 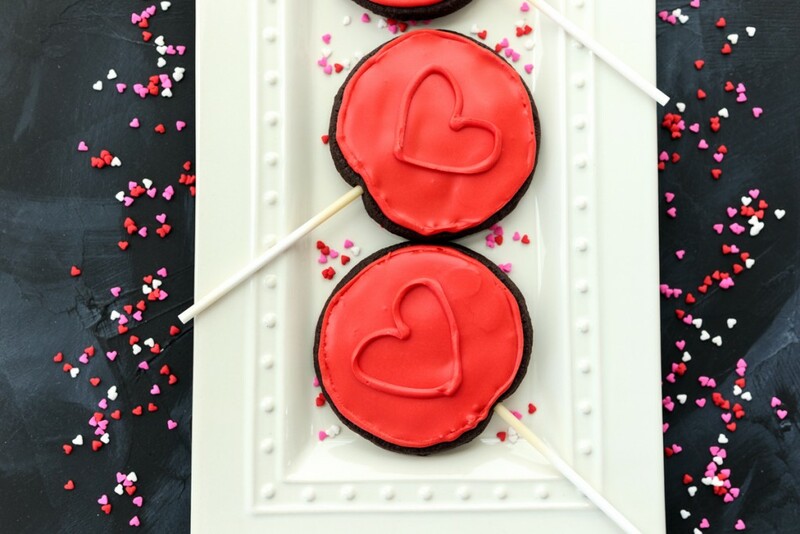 Use a rolling pin or your hands to form it into the shape your want. Try to get an even thickness all the way around. 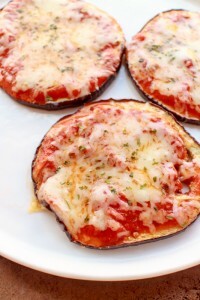 Arrange the sliced potatoes on the pizza dough in a single layer, slightly overlapping. 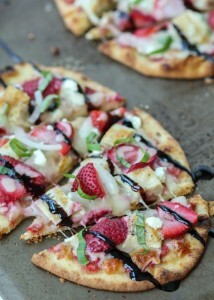 Next, layer the fresh mozzarella slices in a single layer, slightly overlapping. Then top with the leeks and cooked bacon. Crumble the goat cheese over top then add some fresh grated Parmesan and some fresh ground black pepper. If you want some color on your crust, lightly brush the beaten egg on the exposed crust. Carefully put the pizza in the oven on top of the pizza stone to cook for 9-10 minutes. If you are using a baking sheet, just put the baking sheet directly on top of the pizza stone. To prepare the leeks: Trim off the dark green parts and discard. Trim off the root end and discard. Thinly slice. Leeks harbor a lot of dirt so special care needs to be taken to remove all the grit. Fill a large bowl with cold water and add the sliced leeks. Swirl and rub the leeks with your hands to dislodge any dirt. The dirt will sink to the bottom of the bowl so remove the leek pieces with a slotted spoon or your hands and set to drain in a colander. Shake off and lightly pat dry before putting in the skillet. 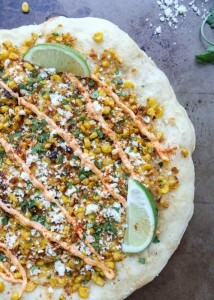 Recipe adapted from The Pioneer Woman Cooks: Recipes from an Accidental Country Girl.